Guy: [Unimpressed] Hmph, sounds like she’s hitting a baby with a cat. Lisa: You have to listen to the notes she’s NOT playing. Guy: [Still unimpressed] Pssh, I can do that at home. Apologize for the general crumminess of the photos but we risked looking like douchebags to capture these on Jeff’s cellphone. I should mention at this point that we had cushy behind-the-pillar seats and decided to move up to the front for Camera Obscura’s set. What a mistake that was. There was a bald French-Canadian guy standing near us whose horrific yell-singing was only surpassed by his bizarre shout-conversations and mixed grunts. Then there was the Asian bus-tour group that felt they needed to round up all 8-10 members of their group for every smoke break and drink run. In regards to the first guy, you may accuse me of being a dour-faced non-fan. Look, I can appreciate enthusiasm but there is a point where enthusiasm reaches obnoxiousness, and obnoxiousness crosses the line into just plain disrespect. This guy not only crossed those lines but danced all over them. In regards to the second group, I can appreciate having the need to do a drink run or smoke break as much as the next guy but does EVERY member of your party have to push and prod your way in and out of the crowd for this? Onto Camera Obscura’s set. I have to say that I’m a little bit shocked as to how much cordial banter they engaged us in after Vik’s review of their show in Vancouver but I think most of that had to do with plain ego-inflation more than anything else. Allow me to explain. At 11:45 PM (almost an hour after Rossi wrapped up) the impatient sold-out crowd began the waves of foot-stomping, chanting, and applause to get their asses on stage. Less than 1 minute after this started, lo-and-behold, they popped out in full postmodern Carter Family garb. If mass accolade was all they were waiting for, I can guarantee you that the audience would’ve been happy to bring down the house down at 11:00 PM. Despite what Elvis would have us think, leotards and layered polyester are not heat-friendly materials – I was actually worried that a couple of the members would (as they said) “keel over” at some point. Slow songs do need to be interspersed here and there. You want to give your fans the show they paid for, which we more than appreciate, but sometimes boo-boos are good. A pre-show qualuude may help, not that I am condoning that, but hey not every song has to be perfect. We’ll sell out your shows anyway because you write and perform sweet, catchy tunes. 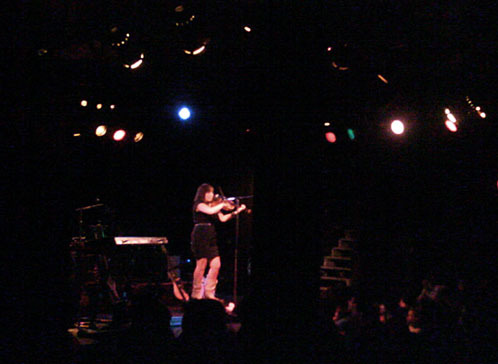 I decided to check out the Camera Obscura show Saturday night with opener Anni Rossi. It was a mini 4AD showcase! The doors opened at 9:00 pm but we had to wait until 10:45 before the restless crowd was introduced to Anni Rossi. She played a scant four songs, finishing just shy of 11. Her short set was met with confusion from the majority of the audience. I don’t think they were ready for her unique brand of performance, Allison included. We waited another 45 minutes and at 11:45 Camera Obscura took the stage. Unusually, the band front loaded their set with slow songs, which we ended up learning from a bit of banter Tracyanne later on was due to trying not to work up too much of a sweat. This is Toronto’s humidity season and tonight was a sweltering roaster – and even hotter inside the packed Lee’s Palace. Finally, Camera Obscura blasted into fast songs – Honey In The Sun, Let’s Get Out Of This Country, Lloyd I’m Ready To Be Heartbroken, Dressed To Kill, French Navy and more. During the first few lines of Let’s Get Out Of This Country, Tracyanne stopped the band and made some motions to the sound guy to raise her mic volume. She really is the leader of this band. Predictably, the crowd went nuts when Tracyanne sang the lines “if the blood pumping through my veins could freeze like the river in Toronto” in the song Forests & Sands. 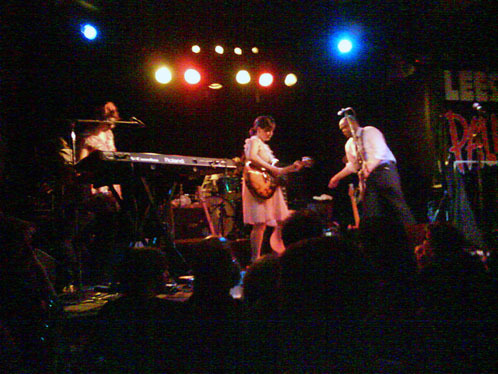 Afterwards, I hit the merch table instead of waiting amongst the throng of fans awaiting Camera Obscura after the show. Anni Rossi was manning the merch table so I said hello and offered my thanks for the good but brief set and told her I was looking forward to her return to the city in mid-July where this time she’ll be the headliner. pretty sure Anni Rossi’s mid-July set is opening for Micachu at the El Mocambo. Not headlining, but hopefully more than a 20-minute set. Hey frank, thanks for clarifying. We were wondering why she even bothered going on with C.O. if she was going to be limited to 18 minutes of fame (maybe this was her choice?). Thoughts? Hope her strategy plays out longer next time. I liked her 3rd tune. Nice to see they pulled their socks up for the TO show, although I’m not surprised, I have yet to hear a song that has ‘Vancouver’ in the lyrics. I find that troublesome though. Only engaging crowds who stroke your ego sufficiently = poor showmanship. …wasn’t there a Violent Femmes song called Vancouver?